Indian patients undergoing surgical aortic valve replacement (SAVR) differ from western populations with respect to aortic annulus size and valve disease morphology. The purpose of this post-market, non-randomized observational study was to evaluate the early hemodynamic performance of the Trifecta™ bioprosthesis (Abbott, previously St. Jude Medical, Minneapolis, US) in an Indian patient population. From January 2014 to September 2015, 100 patients (mean age 64.4 ± 7.1 years, 62% male) undergoing SAVR for valve disease (68% stenosis, 7% insufficiency, 25% mixed pathology) were enrolled across 10 centers in India. Patients implanted with a 19–27 mm Trifecta™ valve were eligible to participate and were prospectively followed for 12-months post-implantation. Echocardiographic hemodynamic performance was evaluated at pre-implant, pre-discharge and at 12-months by an independent core laboratory. Adverse events were adjudicated by the study sponsor. Functional status at 12-months was assessed according to NYHA classification. Continuous data was summarized using descriptive statistics (mean &standard deviation,) and categorical data was summarized using frequencies and percentages. Ninety patients (mean age 64.5, 62.2% male) completed the 12-month follow up. Significant improvements in hemodynamic valve performance were reported in 81 patients with available echocardiographic data at 12 months. Compared to baseline at 12-month follow up visit, mean effective orifice area increased from 0.75cm2 to 1.61cm2 (p < 0.0001), mean pressure gradient reduced to 10.42 mmHg from 51.47 mmHg (p < 0.0001), cardiac output increased from 4.46 l/min to 4.85 l/min (P 0.9254). Compared to baseline, functional status improved by ≥1 NYHA class in 75% of patients at 12 months (95% Clopper-Pearson (Exact) confidence limit [64.6%, 83.6%]). No instances of early mortality (< 30 days from index procedure) or structural valve dysfunction were reported. In an Indian patient population, implantation of the Trifecta™ bioprosthesis is shown to be safe and associated with favorable early hemodynamic performance and improved functional status at 12 months. The clinical study has been registered under Clinical Trial Registry-India (http://www.ctri.nic.in) and registration number is CTRI/2014/02/004434 registered on 25 February 2014 retrospectively registered. Each year, approximately 150,000 patients undergo cardiac surgeries and 30% is the valve surgeries including both aortic and mitral valve replacement in India . Compared to western populations, Indian patients indicated for SAVR tend to be younger, have a higher incidence of valve disease due to rheumatic fever and require implantation of smaller valve sizes (predominately 19 mm and 21 mm valves) [2–4]. Due to the need for implantation of smaller bioprostheses, the risk for patient-prosthetic mismatch (PPM), defined as an effective orifice area (EOA) that is too small in relation to a patient’s cardiac output requirements, is high in Indian patients. PPM leads to poor hemodynamic valve performance (namely elevated transvalvular pressure gradients) despite a fully functioning prosthesis and is associated with poor clinical outcomes including late survival, freedom from heart failure, and LV mass regression . Thus making selection of an appropriate bioprosthesis that maximizes EOA critical in this patient population. The Trifecta™ bioprosthesis (Abbott, previously St. Jude Medical, Minneapolis, US) is a tri-leaflet, stented, bovine pericardial valve designed for supra-annular placement in the aortic position. The TrifectaTM valve has been commercially available in India since 2012 and incorporates several novel design features to maximize valve hemodynamics while minimizing leaflet stresses . Specifically, the valve features a true supra-annular polyester sewing cuff with a silicone insert that is designed to conform to the shape of the native annulus and externally-mounted bovine pericardial valve leaflets that wrap around the fatigue resistance, titanium stent frame to maximize EOA and improve hemodynamic performance. To reduce the risk of leaflet abrasion and structural valve dysfunction, the stent frame, excluding the sewing cuff, is covered with porcine pericardial tissue to allow only tissue-to-tissue contact during valve function. Linx™ AC anti-calcification technology also reduces calcification of the tissue valve. The superior hemodynamic performance of Trifecta™ valve has been previously demonstrated in western patients with significant benefits in hemodynamic performance, EOAs and mean transvalvular pressure gradients reported in patients with different annulus sizes [7–12]. Due to the limited data available on Indian patients undergoing SAVR in rheumatic heart disease and with most of the patients having significantly smaller native aortic annuli, the EVEREST study (A clinical EValuation of hEmodynamic peRformancE of Trifecta™ valve in Indian SubjecTs), was conducted with a purpose to evaluate the early (12 months) hemodynamic performance of the Trifecta™ valve by echocardiography in Indian patients for treatment of aortic valve disease. Assessment of the early safety of the valve and changes in NYHA functional classification was also performed. Between January 2014 to September 2015, 100 patients who had undergone SAVR with a Trifecta™ valve were recruited from 10 investigational centers in India to participate in the prospective, single-arm, post-market observational EVEREST study (CTRI/2014/02/004434). Eligibility criteria included implantation of a Trifecta™ valve within 7 days and analyzable echocardiographic data at baseline. Patients who had been previously implanted with a prosthetic valve(s) at a site other than the aortic valve, on renal dialysis, pregnant, active endocarditis or pre-existing cardiovascular abnormalities (aortic dissection or ventricular aneurysm) were excluded. Prior to patient enrollment, appropriate institutional review board approval for protocol, patient information sheets and consent forms were obtained at each center. The study was performed in accordance with the Declaration of Helsinki and with laws and regulations of the country. A written informed consent was obtained from each patient prior to enrollment. Details on the 10 investigational centers are provided in Appendix. The study protocol permitted operative surgeon’s to use any surgical technique at their discretion for implantation of the TrifectaTM valve. Data on valve size, surgical approach, suture technique, cardiopulmonary bypass time and aortic cross clamp time were collected. Post- operative protocol was as per Institute’s standard protocol with anticoagulant and other standard medications. Preoperative and procedural data was retrospectively collected from the implant centers. Perioperative data collection included patient demographics and medical history, NYHA functional class, disease valve etiology, valve dysfunction (insufficiency/incompetent/regurgitated, stenosis & mixed), echocardiographic exam and pathology. Procedural data collection included implanted bioprosthetic valve size, suture technique, cardiopulmonary bypass time and aortic cross clamp time. All follow-up data was prospectively collected as part of routine clinical practice. At pre-discharge, 6 month and 12-month follow-up visits, subjects underwent a physical examination, echocardiographic exam (pre-discharge and 12 months only), assessment of NYHA functional class and review of relevant cardiac medication. Transthoracic echocardiographic examinations were performed on-site at baseline, pre-discharge (average 6 days of index procedure) and at 12 months by an experienced Echocardiographer. All exams were reviewed by an independent core laboratory by Department of Non-Invasive Cardiology at Fortis Escorts Heart Institute, New Delhi and evaluated for the following parameters: left ventricular function, mean transvalvular pressure gradient, mean pressure gradient, effective orifice area (EOA), cardiac output, cardiac index, and performance index (EOA/Pre-implant Interval Orifice area) [13, 14]. EOA was calculated using the continuity equation [13–15] and indexed to body surface area (indexed EOA). The incidence and severity of aortic insufficiency (paravalvular, valvular or indeterminate with clinical (visual) estimation of regurgitation as trivial, mild, moderate or severe) was assessed according to standardized VARC criteria. The study’s primary endpoint was valve hemodynamic performance (as measured by echocardiography) at 12 months. Secondary endpoints included change in NYHA functional class from baseline to 12 months (defined as no change, improved, or worsened), incidence of structural valve deterioration (calcification, leaflet tear and/or perforation) and cardiovascular-related adverse events at 12 months. The study sponsor (Abbott) was responsible for adjudication of adverse events and determining their seriousness and relationship to the study device and or study procedure. Continuous data was summarized using descriptive statistics (mean &standard deviation) and categorical data was summarized using frequencies and percentages. All echocardiographic parameters were stratified according to the nominal size of the implanted Trifecta™ valve. Comparisons of change between 12-months and baseline in echocardiographic evaluation of valve performance was analysed using Student’s t test (if Normal distribution assumption is met) or Wilcoxon signed-rank test (if Normal distribution assumption is not met). The 95% exact confidence interval is provided to the percentage of the patient with improved NYHA functional between 12-months and baseline. Statistical analyses were performed using SAS™ software v9.4. Baseline clinical and demographic data of the 100 patients enrolled in the study is presented in Table 1. Briefly, patients were predominately male (62%) elderly (mean age 64.38 ± 7.05 years) and had multiple comorbidities including hypertension (51%), coronary artery disease (38%) and diabetes (38%). The main indication for SAVR was valve disease due to degenerative calcification (54%); with only 14% due to rheumatic heart disease. Preoperative NYHA functional class was distributed as 5% Class I, 52.04% Class II, 39.8% Class III and 3% Class IV. Sinus rhythm was observed in 97 patients while 3 patients had a pre-existing arrhythmia. Procedural outcomes are summarized in Table 2. All prostheses were implanted in a supra-annular position, with the majority of surgeons using a median sternotomy surgical approach (77%) and simple interrupted suture technique (51%). Thirty-three patients underwent a concomitant surgical procedure; with 28% requiring coronary artery bypass grafting. Average cardiopulmonary bypass time was 112.1 ± 49.2 min and average aortic cross clamp time was 78.4 ± 33.8 min. Patients were predominantly implanted with a 19 mm (n = 36) or 21 mm (n = 45) Trifecta valve. For the purposes of subsequent analyses, all patients implanted with a 23 mm (n = 13), 25 mm (n = 5) and 27 mm valve (n = 1) have been grouped into a single cohort. There were no instances of intra-procedural mortality. 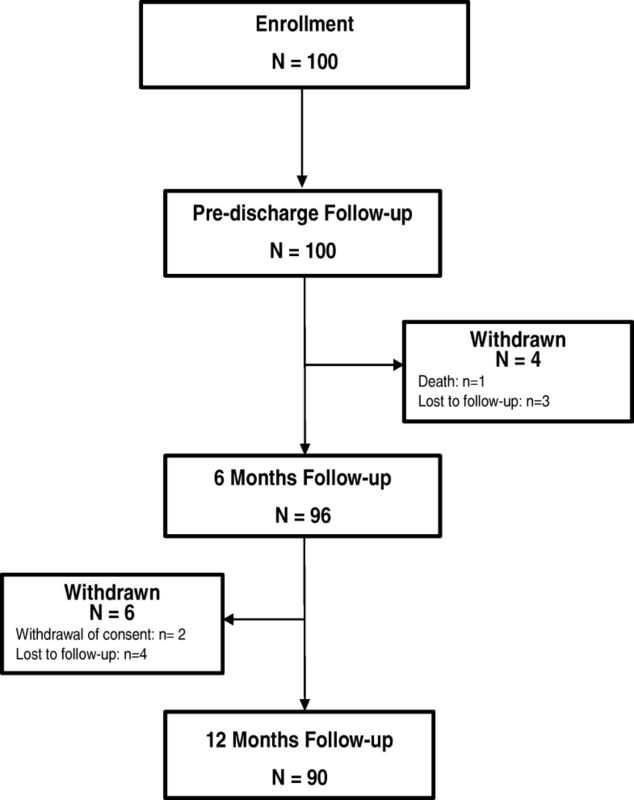 A total of 90 patients completed the 12-month follow-up visit (90%; Fig. 1: Flow chart). The remaining 10 subjects either, were lost to follow-up (n = 7) or formally withdrew consent (n = 2) and died (n = 1). The percentage of patients receiving anticoagulation therapy at different visits is shown in Table 3. At baseline 81%, pre-discharge 95%, 6 months 91% and 88% at 12 months were receiving anticoagulation therapy. Analyzable echocardiographic data was available for 81 patients (90%; echocardiographic images for 9 patients were not as per the Core Laboratory requirements) at 12 months follow-up. A consistent low mean pressure gradient across the prosthesis was observed, which was maintained till 12 months of follow-up. Baseline, pre-discharge and 12 month’s echocardiographic parameters according to valve size are summarized in Table 4. The average mean pressure gradients were 51.47 ± 18.34, 10.44 ± 4.40 and 10.42 ± 4.77 at baseline, pre-discharge & 12 months respectively. Results for effective orifice area and effective orifice area index are shown in Table 4. The average effective orifice area was 0.75 ± 0.42, 1.59 ± 0.37 and 1.61 ± 0.30 at baseline, pre-discharge & 12 months respectively The average cardiac was 4.46 ± 2.39 at the time of baseline, 4.45 ± 2.03 at pre-discharge and between 4.85 ± 1.69 at 12 months. (Table 4). Performance Index was calculated at baseline and pre-discharge and at 12 month and is depicted in Table 4. The average performance index was 0.22 ± 0.11 at the time of baseline, 0.47 ± 0.11 at pre-discharge and 0.48 ± 0.08 at 12 months. The average indexed EOAI for all the valves is 0.91 ± 0.19 cm2/m2 which is above the PPM threshold of ≤0.85 cm2/m2 with a significance p-value of < 0.0001. Hence, no prosthetic patient mismatch was observed (Table 4). 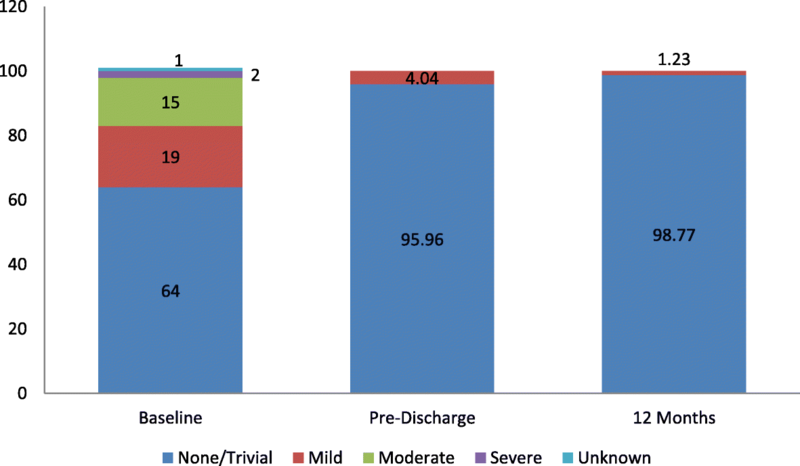 Aortic regurgitation was observed at baseline in 36 patients (Mild to Severe), at pre-discharge in 4 patients (mild) and at 12 month in 1 patient (mild); none of the patients had moderate or severe aortic regurgitation at pre-discharge and 12 month. (Fig. 2: Summary Statistics for incidence/severity of aortic insufficiency Measurements). At 12 months, no incidence of structural valve deterioration, valve thrombosis, or hemolysis was observed. Nine subjects reported 9 separate SAEs events including: hepatic encephalopathy, post pericardiotomy effusion, cerebrovascular accident/intracerebral hemorrhage, complete heart block, metastatic lymph nodes, peripheral vertigo, ventricular arrhythmias, decreased sodium levels and increased total white blood cells and low tract respiratory infection. No SAEs were deemed to be valve related. A single patient death (1%) was reported 37 days post-implant, and was deemed related to a low sodium level (no valvular/para valvular leak was observed in pre-discharge echocardiographic images and had a well- functioning prosthetic aortic valve). In 88 (NYHA data not available for 2 patients) patients with available data at 12 months, NYHA functional status improved by ≥1 class in 75% of patients (66/88) compared to baseline. Only 1 patient reported a worsening in NYHA function class at 12 months compared to baseline (mild AR was observed at 12 months); the remaining 23.9% of patients experienced no change. (Fig. 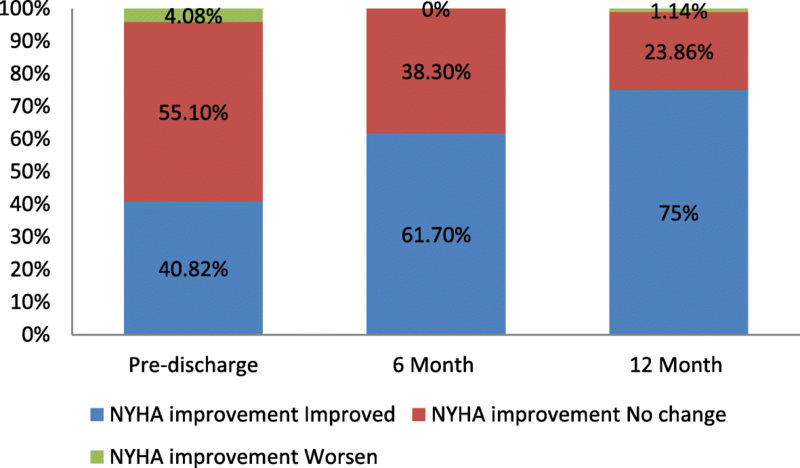 3: Changes in NYHA functional status at pre-discharge, 6 months and 12 months compared to baseline) summarizes the proportion of patients that improved, did not change, or worsened in NYHA functional status at pre-discharge, 6 months and 12 months compared to baseline. According to the guidelines of the American Heart Association/American College of Cardiology (AHA/ACC), bioprostheses have been chosen as the most appropriate aortic valve treatment for patients older than 65 years with severe valve stenosis . It is predictable that the number of AVRs with bioprosthesis will become more frequent in future owing to growth of aging population. This is further relevant for developing countries like India where majority of the population cannot afford Transcatheter aortic valve replacement therapy and would rely on surgical approach for treatment of aortic valve disease. The present prospective, multicenter study evaluated the safety and hemodynamic performance of the Trifecta™ valve across 10 centers in India over a 12 month follow-up duration. The study showed significant portion of patients within smaller age group (mean age of 64 years), 81% had smaller valve size of 19 & 21 mm. The patients with rheumatic heart disease were relatively smaller (14%) owing to study being conducted at big cities across India with relatively better hygiene conditions. The data was in line with previously reported literature [2, 3, 7, 8, 11, 12]. The Trifecta valve was associated with a good safety profile with no incidences of valve thrombosis, clinically significant hemolysis or structural deterioration reported during the 12-month follow-up period. No patient reported any valve-related perioperative complications and overall survival at 12 months was 99% (One death), which is in line with previous reported data [7–10] for patients implanted with the Trifecta valve. The data from present study establishes acute safety of Trifecta™ Valve in Indian patients. In previous studies, it has been demonstrated that the external mounting of leaflets in Trifecta™ valve allow for a wider opening, and the expansible stent could limit impedance to flow during high flow conditions as during exercise . The present study demonstrated excellent early hemodynamic performance of the Trifecta™ valve across 12 month follow-up. In the study, the mean pressure gradient for each sized valve was 10.89, 10.71 and 8.96 mmHg for the 19, 21, and (23 + 25) mm valve sizes respectively which compares favourable with previously published data in 1022 patients implanted with a Trifecta valve . Similar results were also reported by Dell’aquila and colleagues  who studied 70 patients undergoing SAVR with the Trifecta™ valve. Echocardiographic data at discharge showed that the mean pressure gradient was 14.4, 11.1, and 10.9 mmHg for the 19, 21, and 23 mm valve sizes respectively. The results of a multicenter study by Bavaria and colleagues  evaluating 1014 patients undergoing AVR with the Trifecta™ valve were recently reported. In that report, echocardiographic data at discharge and at 12 month showed that mean PG was 9.3/10.7, 7.8/8.1, and 7.3/7.2 mmHg for the 19, 21, and 23 mm valve sizes respectively . In our study, EOA for each size valve was 1.58, 1.56, and 1.76 cm2 for the 19, 21, and 23 mm valve sizes, respectively. These data suggest that Trifecta™ valve has a large EOA, similar to previous data (1.41, 1.63, and 1.81 cm2 for the 19, 21, and 23 mm valve sizes, respectively) and multicenter study by Bavaria and colleagues (1.58, 1.77, and 1.94 cm2 for the 19, 21, and 23 mm valve sizes, respectively) . Currently, the importance of avoiding prosthesis patient mismatch (PPM) (i.e. effective prosthetic valve area, after implantation, which is less than that of a normal human valve) is widely accepted [20–23]. The best variable for defining PPM is ratio of prosthetic EOA to BSA i.e. EOAI< 0.85 cm2/m2 which is the common cut-off value for all types of prosthetic valves. In our study the average EOAI observed for 19 mm valve size is 0.95 ± 0.14 cm2/m2, 21 mm valve size is 0.87 ± 0.13 cm2/m2 and 23/25/27 mm is 0.96 ± 0.32 cm2/m2. The Trifecta™ valve demonstrates excellent hemodynamic performance on this point and no PPM observed in our study in patients with smaller annulus which is in line with the previous studies’ result. The study also showed patients had significant improvement with respect to functional class over period of 12 months (75% showed improvement). With the availability of the Trifecta™ valve, several bioprostheses, options are now available, Carpentier- Edwards Perimount (CEP, Edwards Lifesciences, Irvine, CA, USA); CEP Magna (CEPM, Edwards Lifesciences); Mosaic (Medtronic, Minneapolis, MN, USA); Mosaic Ultra (Mosaic U, Medtronic). However, the performance of these valves in Indian scenario over a long term follow-up study is still warranted. There are few limitations of the present study including limited number of patients’ enrolled and short follow-up duration without any comparator arm. In the study, fractional shortening was used to evaluate left ventricular function instead of ejection fraction. Left ventricular mass regression was also not assessed. This study reports excellent early clinical and hemodynamic performance of the Trifecta™ valve in an Indian patient population. Importantly, no procedural mortality or structural valve deterioration was reported. The current study evaluated 12 months follow-up data of hemodynamic performance of Trifecta™ valve however a long term follow-up study is required in India. The author’s thank to Sameer Srivastava & Arif Mustaqueem for echocardiographic data collection. The study was funded by Abbott Pvt. Ltd. The number of the authors is justified by the multicenter design of the study. All authors participated in data collection and/ or interpretation of the data, drafting of the manuscript or revising it critically for important intellectual content. All authors provided final approval to submit the manuscript. The study was conducted in accordance with the Declaration of Helsinki principals and approved by the Institutional Ethics Committee of Madras Medical Mission, Institutional Ethics Committee of Care Institute of Medical Sciences, Institutional Ethics Committee of Star Hospital, Institutional Ethics Committee of Apollo Gleneagles Hospital, Institutional Ethics Committee of Fortis Hospital, Institutional Ethics Committee of PD Hinduja Hospital and Research Center, Sal Ethics Committee of Sal Hospital, The Independent Ethics Committee of Fortis Escorts Heart Institute, The Institutional Ethics Committee of Max Super Speciality Hospital and Yashoda Academy of Medical Education and Research Institutional Ethics Committee of Yashoda Hospital. Informed consent (Consent to Participate) was obtained from each of the patients. While explaining the study and obtaining consent for participation, participants were told that the results of this research will be published and their identities will be kept confidential.